Denmark and Germany will fight for bronce medal. With a strong team performance at the U19 national team of Austria secured before nearly 650 fans in the finals of the European Junior Championships in 2013. More clearly than we had hoped, it was said at the end of a great football game 28:6 for Austria, where the Germans were often just spectators. Germany got the ball first, but two long passes were not their recipients. After a turnover on downs, the Austrians were first to the ball with a crisp running game, especially on running back Matthias Kiegerl, they advanced up to the end zone. After they were initially able to secure its own fumble, wide receiver Vincent Müller began the next turn completely detached a pass from quarterback Christoph Gubisch. The PAT turned Daniel Bernklau sure to 7:0. In the next Offense Drive the Germans, the Austrians intercepted a pass from quarterback Alexander Haupert, but the returner lost the ball right back on the road, so that Germany came into possession again. But again could not be brought under control two long passes from the receiver-Squad. Austria, however, then marched back over Kiegerl and allowed to also appreciate some penalties on the part of the Germans. Austria scored as lighter than expected in this drive. Sandro Platzgummer fitted with a Trickspielzug back to Vincent Müller. Also, the PAT was good by Bernklau and so it was 14:0 for the reigning European champions. A strong run over quarterback Alexander Haupert secured the Germans after another first down in the next offense Drive. But many penalties prevented an orderly build-up play. With nine seconds Restpielzeit the Austrians then knelt and it went off for both teams into the half time break. Germany was motivated out of the cabin and the defense was able to stop the Austrians finally with a deep quarterback sack by Defense liner Moritz Teuchert. The European champions then had to punt for the first time in this game. Rather than now to come finally into gear, then the offense went through punishments through life unnecessarily difficult. The ensuing punt went into the arms of Philip Dubravec who unceremoniously back carried the ball into the end zone German (21:0, PAT Bernklau). 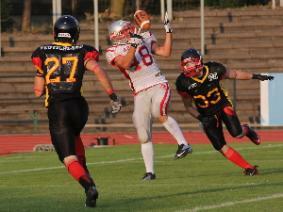 To top it all a pass from quarterback Joao Krapohl was intercepted in the very next drive the Germans. While the Germans arrived barely a pass, made ​​it the Austrians better. Vincent Müller provided a wide space gain and the European champion was back just before the German end zone. Richard Ruthner caught the next pass from QB Gubisch in the end zone to 28:0 (PAT Bernklau) and had it not insert a hard hit. The German offense, however still not gained momentum and had to punt again. The running game of the Austrians was then in the last quarter unstoppable. Especially running back John Streihammer the German Defense escaped with almost every run. In addition, the European champions took many trains running game a lot of time on the clock, what the Germans barely had a chance to own points. But just before the final whistle fumbelten the Austrians at their own 13-yard line and Germany once again got the ball running back Oliver Trabant scored with a powerful run to honor touchdown for Germany to 6:28. The PAT failed to achieve the goal posts. Austria attracts a spotless performance in the final of the U19 European Championship on Sunday in Cologne. Germany will take on Denmark earlier in the match for third place The title of MVP for the German team secured quarterback Alexander Haupert. Running back Matthias Kiegerl was pleased about the MVP title in Austria Team.